Here it is December 10, 2016 and 15 days until Christmas! Have you started your Christmas baking yet? 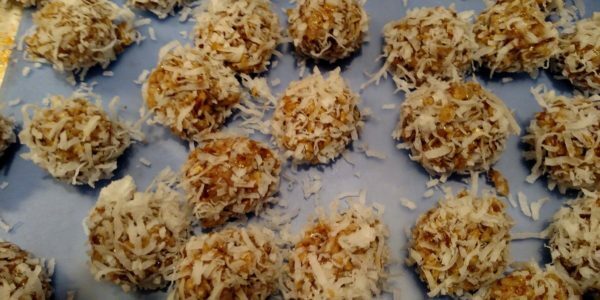 I haven’t done any serious baking, but last night while it was snowing, I decided to make these quick and easy date balls. I think these cookies are really my favorite. Either you love dates or you hate them, I happen to love them. 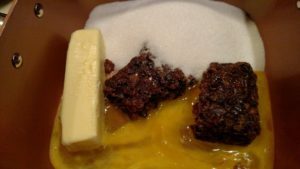 I made some date nut cakes last week, using the date filling recipe on the jar. And I like regular dates (pits removed please) dipped in peanut butter!! I know, a little weird, but try it sometime! This year, I decided not put up my big tree, I’m really missing it though. 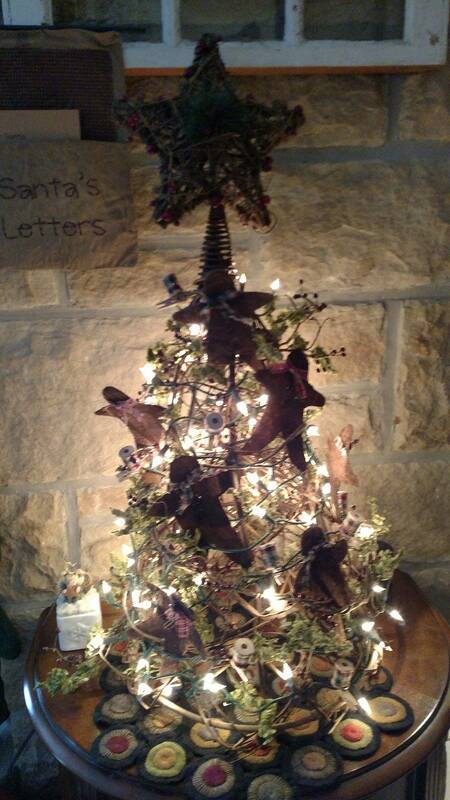 This is the first Christmas in our new house, but it’s just hubby and me and he said, “why go through all the bother to put up the big tree?” Translated, “I really don’t want to haul that tree up from the basement.” lol No ornaments, just a few of my homemade- primitive- gingerbread men that look more like stars in this photo. I’m using my Indian Summer Penny Mat under it. You can purchase these at my online store thetimelesstreasure.com I love these penny mats, I have 3 of them in my living room. This is my fireplace mantel, I love having a mantel to decorate! 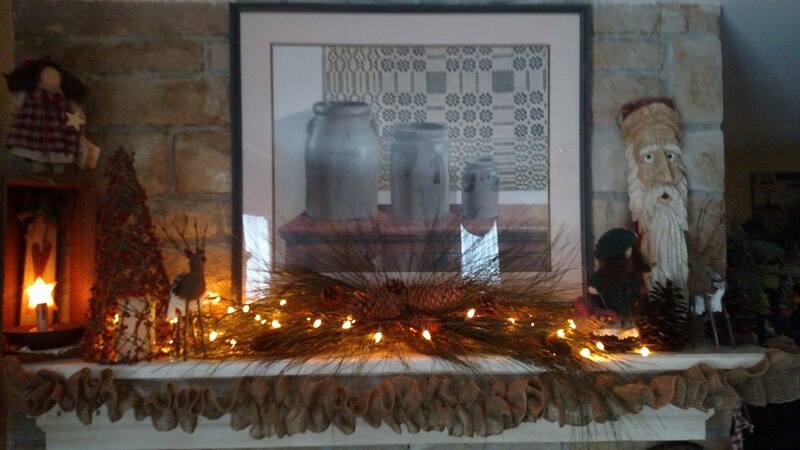 And, I took burlap ribbon and ran some just twine through it to make a ruffle to hang below it. 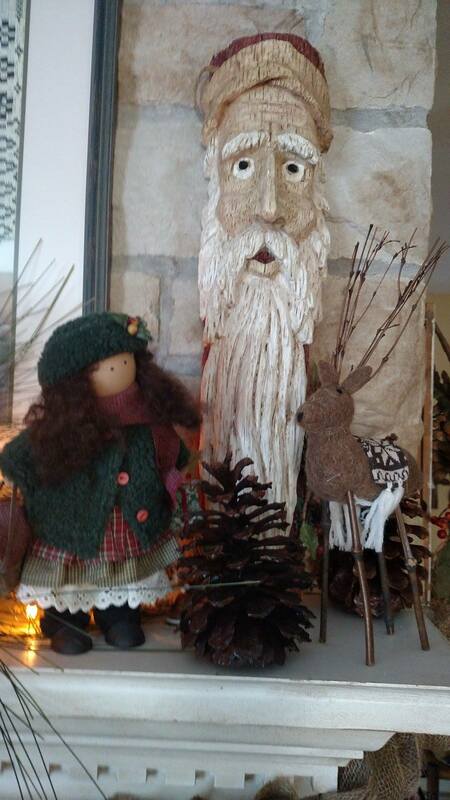 I found this folk art Santa at Goodwill last year for $1.99 and I just love how he looks. 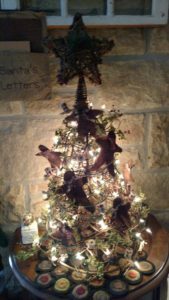 I’m using two large pine cones for trees. The felt reindeer I bought after Christmas last year and the Lizzie High Doll was a $1.99 Goodwill find! 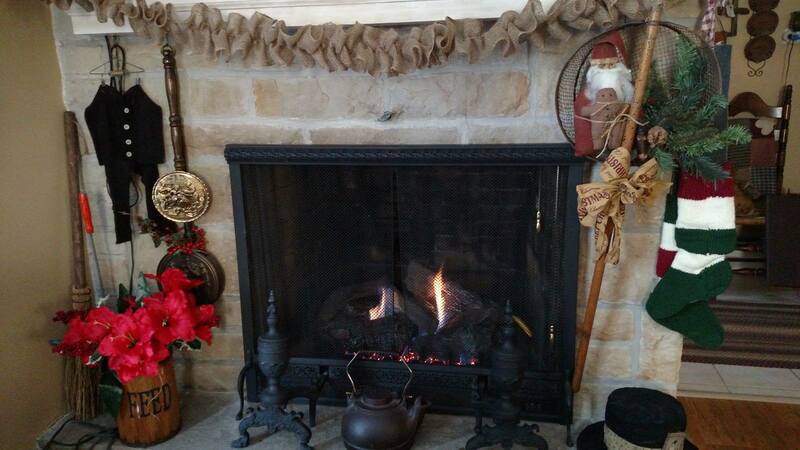 One more photo of my fireplace then we will get to the recipe!! 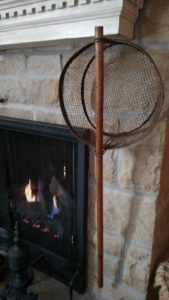 I was antiquing a few weeks ago and came across this antique ash sifter. I never saw one like this with a wood handle on it. My research tells me that they used to sift the ashes to find small clumps of coal that they could reuse to keep the fires going. The ashes has a tendency to smother the fire! 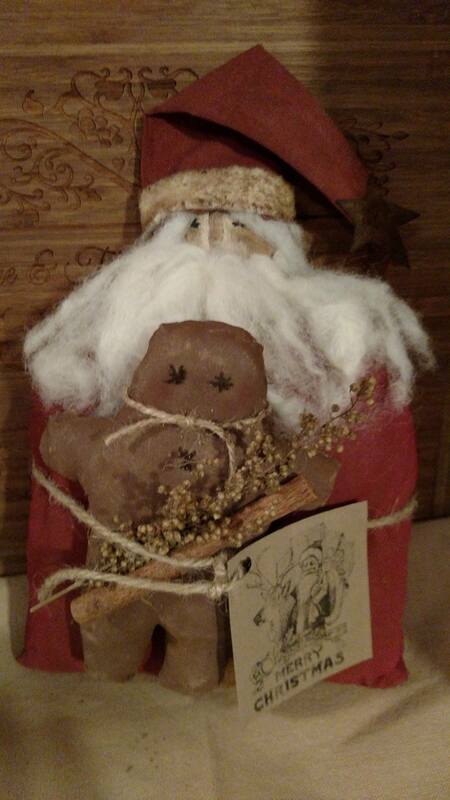 I made a primitive Santa Claus holding a Gingerbread Man and put him inside. Close up view of Primitive Santa- pattern by Chestnut Junction. 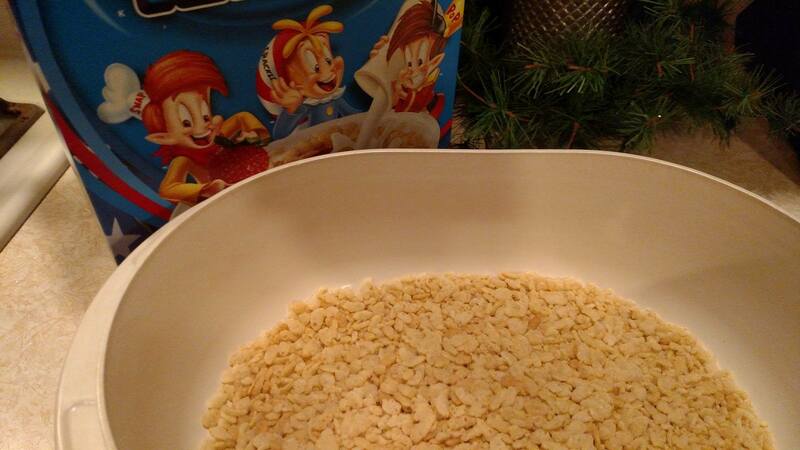 Once mixture is done, pour over the 3 cups of rice krispies. 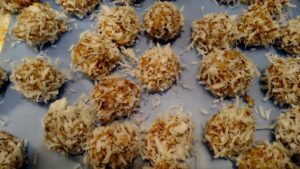 Once mixture has cooled enough to handle, shape into walnut size balls and roll in the coconut. Place on wax paper lined pan to cool. 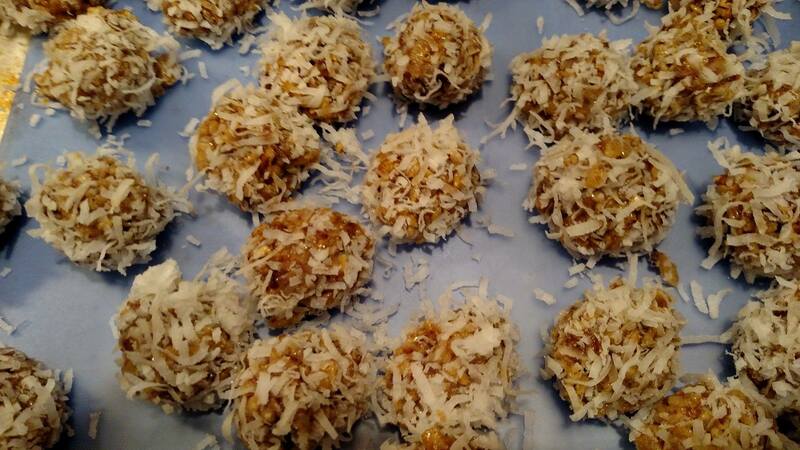 That’s all there is to making these date balls! I hope you will give them a try! 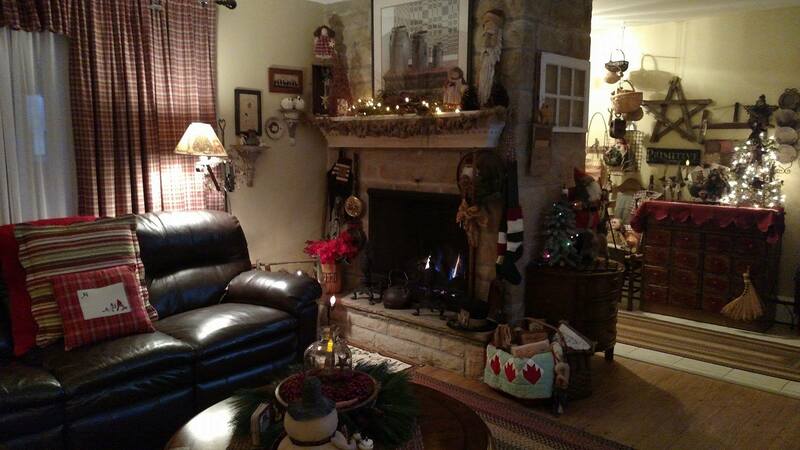 From my home to yours, wishing you a Merry Christmas!